Glass Handling and Glass Lifting Equipment. Glass Vacuum Lifters. We offer you the devices for transport and installation of glass manufactured by Quattrolifts. They allow you to carry, transport, and fit safely and easily glass plates in production areas and warehouses, in difficult places, and also on a construction site. Quattrolifts devices minimise the risk to operators and other personnel during the manual glass transport. 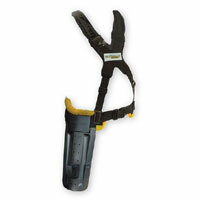 They protect the workers from accidents, spine injury, and sprains. Well-constructed safety systems prevent damage to the glass during transport and fitting of heavy glass plates. If you use our devices at work, you can minimise the number of people necessary to perform the tasks. Please, choose the model of the device to learn about its technical parameters, see its photos and a presentation film. The Nomad is designed to assist glaziers to unload, transport and install glass safely. 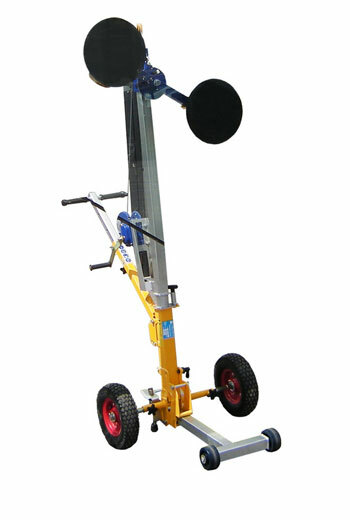 It has a lifting capacity of 400 Kg’s (880 Lbs). It can rotate glass measuring upto 4400 mm (180″). It has adjustments to allow for side and top pocket glazing. The Express is designed to allow a glaziers to unload, transport and install large plates of glass. It has a lifting capacity of 200 Kg’s (440 Lbs). It can rotate glass measuring up to 3660 mm (144″). It has adjustments to allow for side and top pocket glazing. 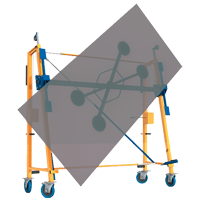 The Mule is designed to assist glass workers to unload, rotate and transport large plates of glass in shop. 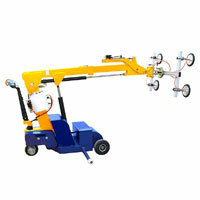 It has a lifting capacity of 300 Kg’s (660 Lbs). It can rotate glass measuring upto 4400 mm (180″). The Mule has a 12 volt battery powered vacuum pump. The Mule is Quattrolifts exciting new machine to allow glazing shops handle heavy glass on and off edgework machines, glass dollies and trucks with greater safety and ease. The Mule has a lifting capacity of 660 pounds (300 Kg) and can be operated by one person. 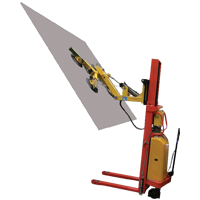 The Horizon is a glass lifter designed for in shop use to assist glass workers to unload, rotate, transport and lay large plates of glass flat onto a cutting table or tempering line. 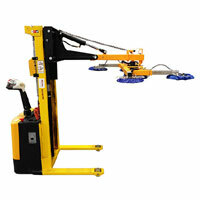 It has a lifting capacity of 300 Kg’s (660 Lbs). It can rotate glass measuring upto 4400 mm (180″). The Horizon has a 12 volt battery powered vacuum pump and 2 hydraulic rams. Quattrolifts have released a new glass lifting machine called the Horizon that will lift and tilt glass to the horizontal. The Horizon will allow one operator to lift glass or an IGU from a rack or truck. 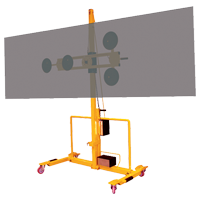 The Vector is designed to allow a glaziers to unload, transport and install large plates of glass with extreme precision. It has a lifting capacity of 400kg’s (880lbs) with a dual vacuum system designed for performance.